The Smart Touch View Interface™ (STVI) is Megger’s second generation of handheld controllers for the new SMRT and older MPRT1 relay test systems. 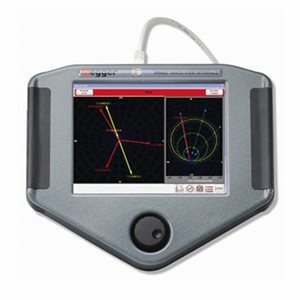 The STVI, with its large, full color, new high resolution, and high definition TFT LCD touch screen allows the user to perform manual, steady-state and dynamic testing quickly and easily using the Manual or Sequencer test screens, as well as using built-in preset test routines for most popular relays. Ergonomically designed for either right or left hand operation, rubber cushion grips, centrally located control knob, and a touch screen, the STVI is extremely easy to use. Use the new built-in stand for single-handed operation. The STVI uses a standard Ethernet cable, and Power Over Ethernet (POE) operation. The STVI includes non-volatile built-in data storage for saving tests and test results. A USB port is provided for transferring test results to your PC. If this is the first time you have downloaded STVI/SMRT firmware programs, you must first download and install the new STVI and/or AVTS software programs before you install the new SMRT firmware. Because of the added firmware security in the SMRT, the older versions of STVI and AVTS software programs will not communicate with the new SMRT firmware. Therefore, it is recommended to download and install the new STVI software prior to installing the new SMRT firmware. The new STVI software can communicate with both old and new firmware versions in the SMRT units. There are two versions of the STVI software on the website. One is for the STVI (handheld controller) unit, while the other resides on your PC as PowerDB.v10. Both software programs should be updated with the latest version of STVI software. 1. STVI Software for PC: For the PC version click on STVI Software for PC. Download the software onto your PC as a zip file. You will need to create a temporary file folder and unzip the file to that folder. Note: If you have previously downloaded PowerDB from the website to a temporary file folder, please delete that file prior to downloading the new software. The software is an install version. If you already have the STVI software PowerDB.v10 software on your PC, PowerDB 10.5.4 will install on top of the existing version. If you have saved test files to My Documents/PowerDB10.X (they will appear as .PdbXml files) it is suggested that you copy those files to the temporary file folder as a backup (installing a new version of the software should not corrupt the saved files, but Megger recommends a backup of test records as a safety precaution). Then click on the Install. 2. STVI Software for handheld controller: Click on STVI Software for Handheld Controller/Onboard Version. The software will be downloaded onto your PC as a zip file. Unzip the file, open Onboard_Install_(version number) folder, Select All files, and Copy to the root directory of a USB memory stick, or create a file on your PC for storage to unzip or extract to a file. If extracting to a temporary file folder on your PC label the file folder so that you can easily navigate to the folder when called upon. As referred to above, select all files and copy to a USB stick. With the STVI powered up, insert the USB memory stick into the USB port on top of the STVI. A window may appear offering the window navigator, press the Cancel button. From the STVI default start up screen, press the Configuration button. From the Configuration screen press the Update Firmware button. A row of buttons will be presented, press the STVI Firmware button and the unit will automatically upgrade the STVI software. Do not remove the USB stick until after the Microsoft “Hibernation” screen appears. Then the “STVI” splash screen will appear. When complete, power down the STVI by disconnecting the Ethernet cable. Wait about 5 to 10 seconds and reconnect the cable. Observe the STVI display screen. When the default test screen appears, press the Configuration button, then press the Display Versions button and verify the version of the software upgrade.